You GUYS! I made a poke cake and filled it with ice cream. 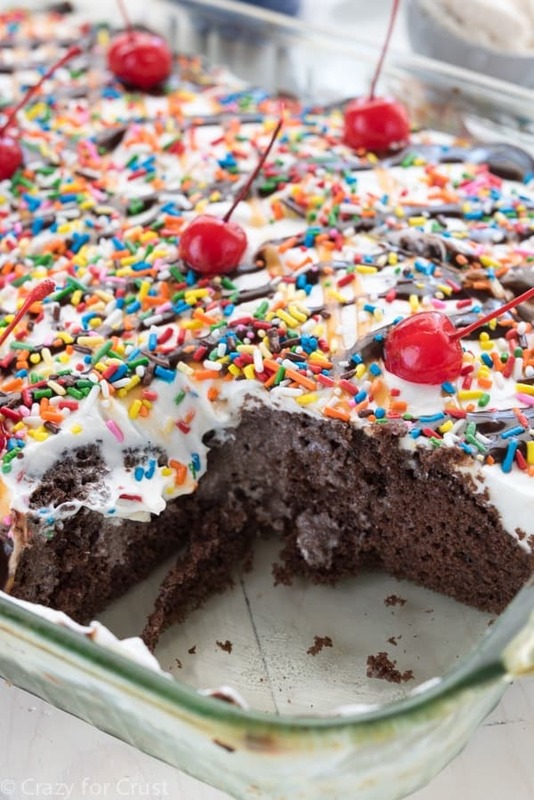 #YoureWelcome This Ice Cream Poke Cake is an easy potluck recipe! 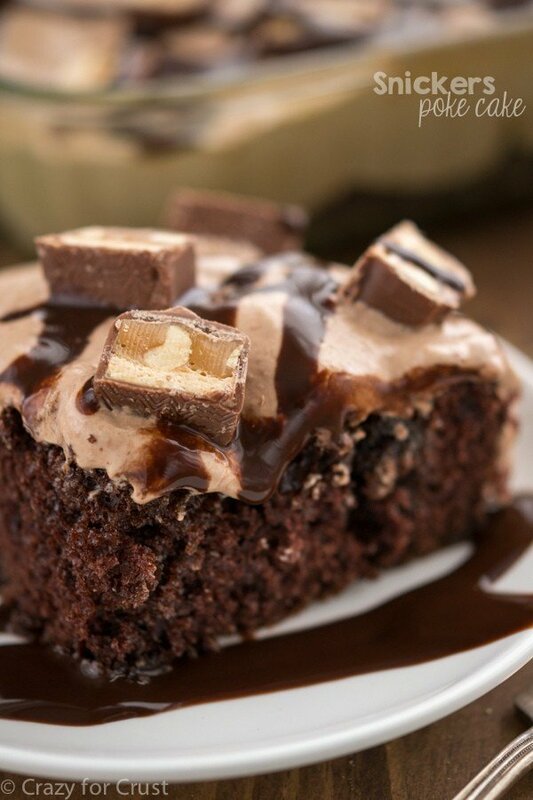 Cake is baked and filled with melted ice cream for a gooey casserole everyone will love. This past weekend we finally watched the American Idol finale. As soon as I heard the New Kids were performing, I got all those butterflies in my tummy. Yes, I’m 37 years old and the thought of listening to Joey McIntyre sing gives me butterflies. Mel queued up the DVR to the right spot and then I watched, dumfounded and open-mouthed while they sang with Daniel. They. Were. HORRIBLE. I couldn’t even finish. I made Mel turn it off halfway through. I just couldn’t even listen to it anymore. It was truly cringe-worthy. Did you all see it? …and all my dreams and childhood angst came crashing down around me. Did they always sound that horrible? You guys. If they were always that bad and I spent over 45,000 hours mooning for them…I just don’t even know where to go from here. Can you imagine what J. Lo and the other judges were thinking? I could practically hear them willing themselves to smile and clap along. You know what’s not really bad? Poke cake. You know what’s really good? When poke cake is poked and filled with ice cream. Anyway. Back to this cake! I love me a poke cake, especially in the summer. And if I’m going to have a cake, a poke is what I’ll choose over any other kind. 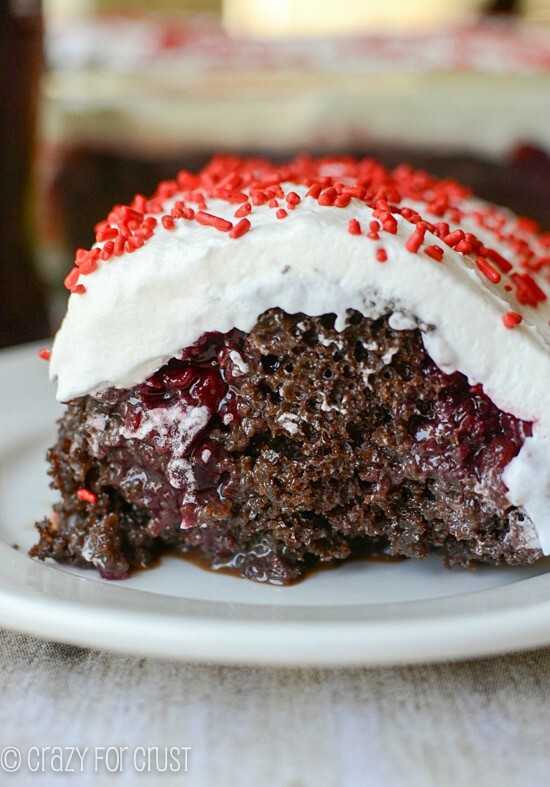 There’s just something magical that happens when the cake is poked and filled with something gooey. It becomes less like “cake” and more like something, well, awesome. This cake starts with a box mix. I love using box mixes to make pokes because it’s just so easy. You’re welcome to use your favorite 9×13″ pan recipe if you prefer from scratch, but I’m a box girl all the way. I used chocolate for this cake because, well, I love chocolate. And that’s the first box I grabbed when I reached into the pantry. You can use your favorite flavor mix, any brand. Just bake it up as the box directs for a 9×13″ pan. These cakes are called “poke” cakes because when they come out of the oven you “poke” them with the handle of a wooden spoon. You do this several times all over the entire cake (probably about 30 holes or so). 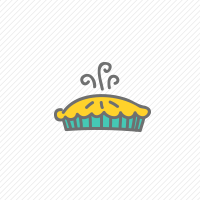 Then you fill the poked holes with something ooey, gooey and delicious. Sometimes you use sweetened condensed milk or hot fudge or caramel. For this poke cake? I filled the holes with melted ice cream. You can use any flavor! When you’re ready to serve, you finish off your ice cream and cake sundae. I frosted my cake with Cool Whip (whipped cream can be substituted). 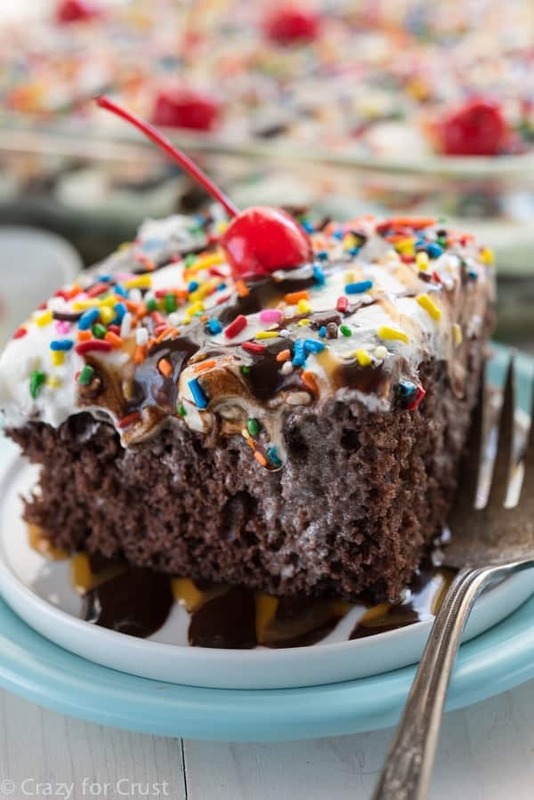 Drizzle some chocolate and caramel ice cream toppings over the top, add sprinkles and cherries, and you have an ice cream poke cake! Everyone will love this cake. It’s perfect for a potluck or as a birthday cake. It’s also the perfect “eat your feelings” cake. 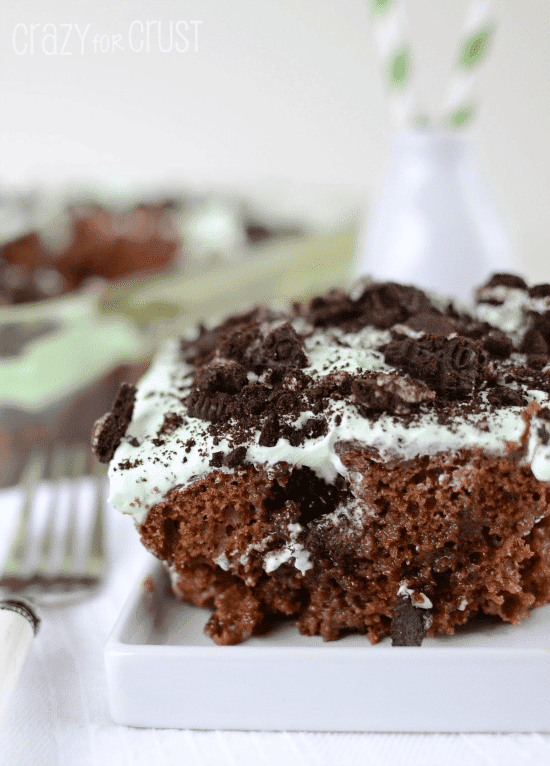 This Ice Cream Poke Cake is an easy potluck recipe! 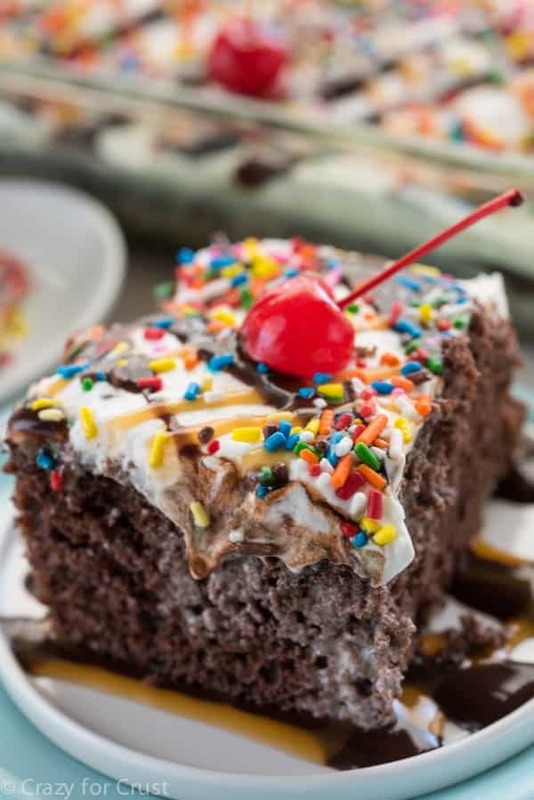 Cake is baked and filled with melted ice cream for a gooey casserole everyone will love. Prepare cake as directed on the box using the water, oil, and eggs called for to make a 9x13” cake. Bake the cake in a 9x13” pan (that has been sprayed with cooking spray) according to the package directions. 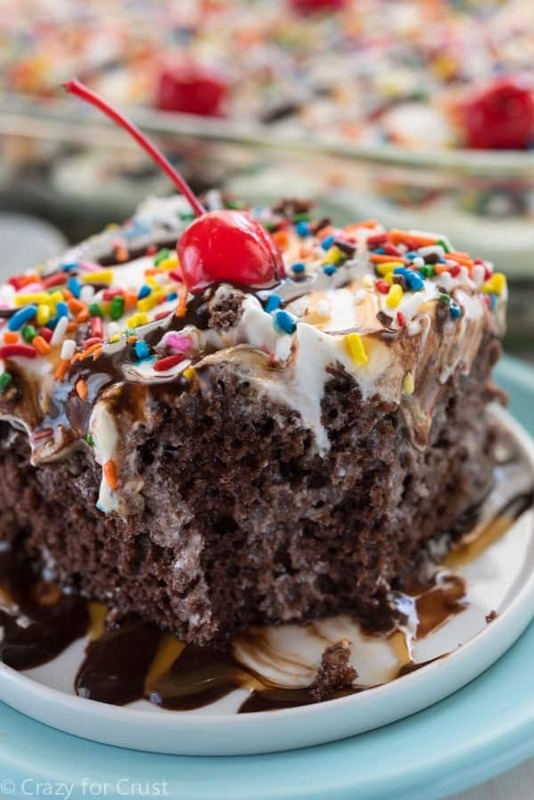 While the cake is baking, place the ice cream in a large bowl and set it near the stove so it can melt. When the cake comes out of the oven, let it cool 5 minutes. Then, using the back of a wooden spoon, poke several holes (about 30 or so) in the top of the cake. Hopefully by now your ice cream is mostly liquid. If not, microwave it for a few seconds until it’s all liquid or just some lumps of ice cream remain. 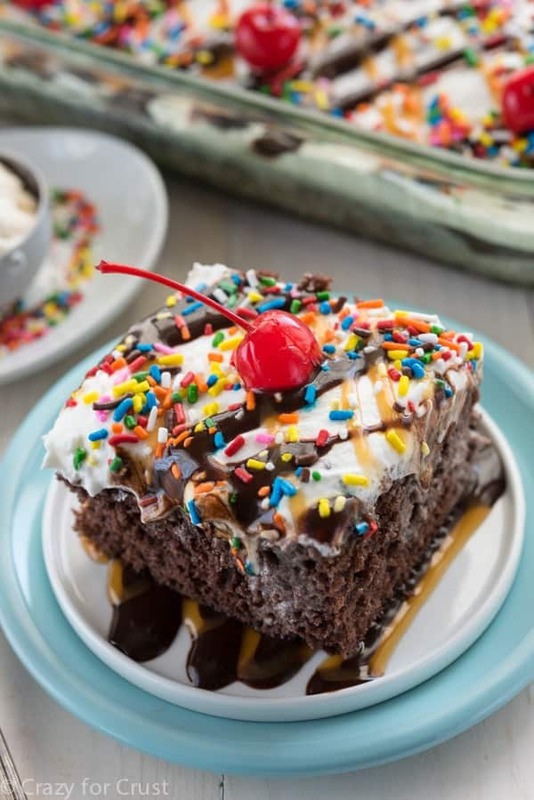 Before serving, frost the top with whipped topping or whipped cream and drizzle with ice cream toppings like chocolate and/or caramel sauce, sprinkles, and cherries. Okay, I had no idea that NKOTB performed, so naturally I Googled it. Yea, it was pretty horrible. This poke cake is PURE GENIUS and I am 100% certain I will be making this for the next office birthday! Right? Absolutely horrid!! Thanks Julianne! Love love love this poke cake. I stopped watching American Idol a few years ago, but now I need to Google for that video! Although once you watch it, you can’t un-watch it. I’m afraid it will ruin me. Lol. This poke cake is genius – PERFECT for summer. Holy moly! This is seriously awesome! What a perfect summer dessert! ohhhh nooo! I’m so sorry about your dreams being dashed 🙁 I feel like I loved NYSYNC and BSB but then I distanced myself and was like “omg I was so lame when I liked them” and now I’m like…they hold up. They were good. No regrets. NKOTB was a letdown..sorry Joey. But everyone has a bad performance every decade or so right?? And btw, the poke cake looks AWESOME. I’ve never even thought of melted ice cream!